81% organic. Defends against urban pollution. Oxygenates for healthier skin. All skin types. Healthy skin is beautiful skin. Suitable for vegans. Advanced anti-pollution skincare with phytoactive Pomegranate enzymes, Kale and fragrant Geranium. Regular, gentle exfoliation removes cellular debris and impurities to encourage natural cell renewal and smoother, healthier skin. 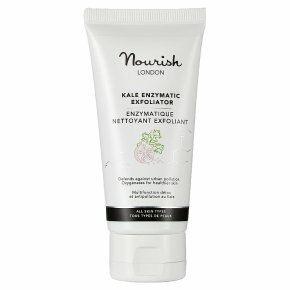 Rich in antioxidants, vitamins C and K, Kale extract protects skin from damaging free radicals caused by stress and pollution. Directions: Daily Cleanser: Smooth a small amount over dry skin and leave for 2 minutes then rinse. Exfoliating Mask: Apply generously to dry skin and massage gently. Leave for 5 minutes. Spritz with toning mist or water. Massage then rinse.